Note: Chef Neil Rankin has now left John Salt. 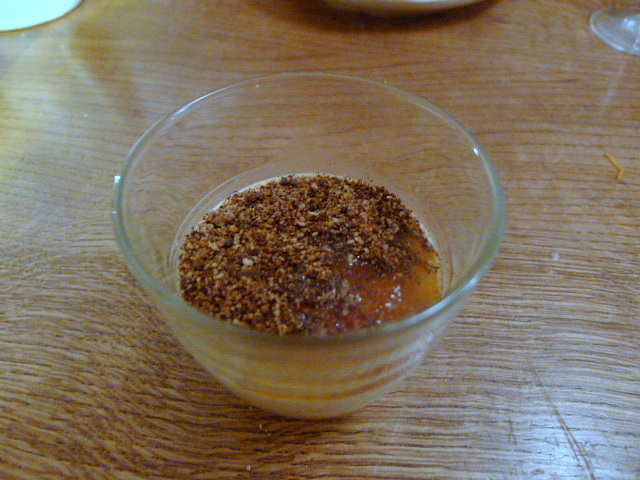 Ben Spalding cooked some amazing food when he was at Roganic. But a year or so into his tenancy he parted ways and headed to the kitchen of John Salt. I would have loved to try the creations Spalding came up with during his time at John Salt since his cooking was sublime. But this was not to be, as he didn’t stay on for very long. Hard to say what happened, but he seemingly did not part on good terms. Anyway it matters not because new Chef Neil Rankin has come into the kitchen with all guns blazing to create an electrifying menu with a Korean twist. Chef Rankin use to be the head chef at Pitt & Cue, receiving rave reviews in the process. I never got to try his cooking at Pitt & Cue on account of being deterred by the queues, so I was really looking forward to this experience. John Salt has a punchy vibe to it. The restaurant use to be a bar, and the long bar area on the ground floor remains with some tables dotted around. Upstairs on the mezzanine level there is a quieter dining area. The restaurant has an industrial feel to it and the space suits the boldness of the menu. 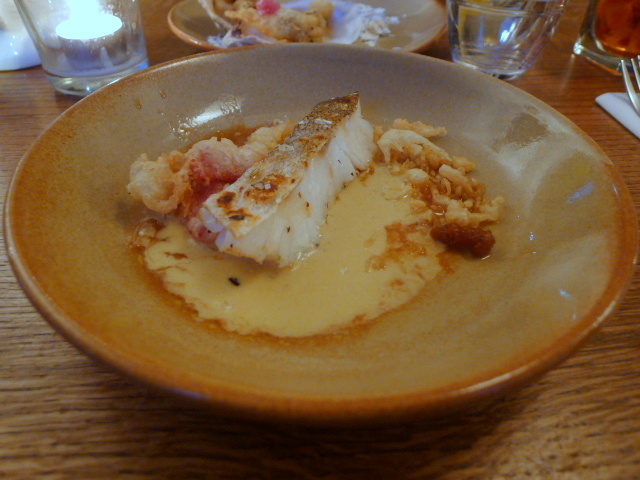 We started with a cod with foie gras sauce and blood orange (£7) that was beautifully cooked. The sauce was wonderfully rich and smooth, even if it was a little salty. The blood orange added an interesting citric twist to the dish and worked really well in binding all the elements of the dish into something harmonious. ‘Burnt leeks’ (£5) weren’t so much burnt, but was a reference to the aroma coming through from the charred effect. 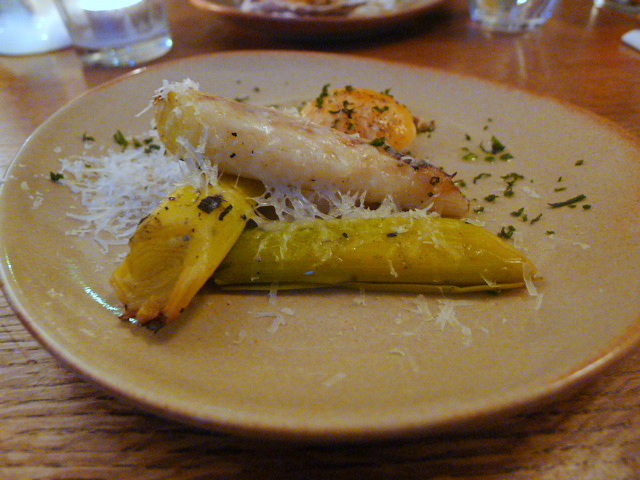 The leeks were beautifully cooked and soft, and the parmesan added nuttiness to the dish. The soft and almost runny (but not quite) egg yolk provided the moisture to bring the dish together. 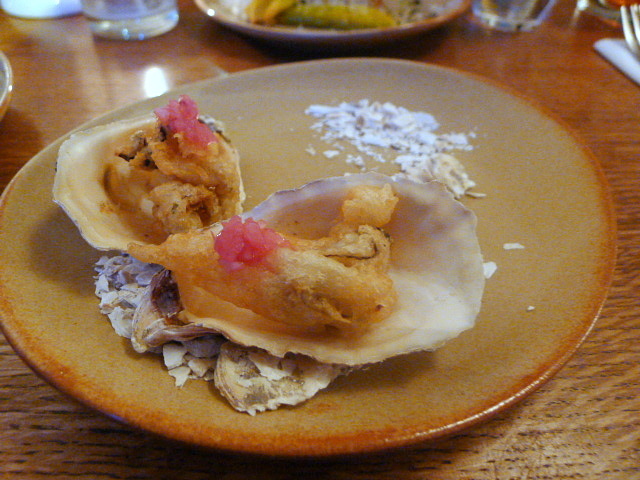 Tempura oysters with beef fat mayo (£7) were really, really tasty. The batter was light and crispy, and the mayo added a hint of zinginess to the oysters. 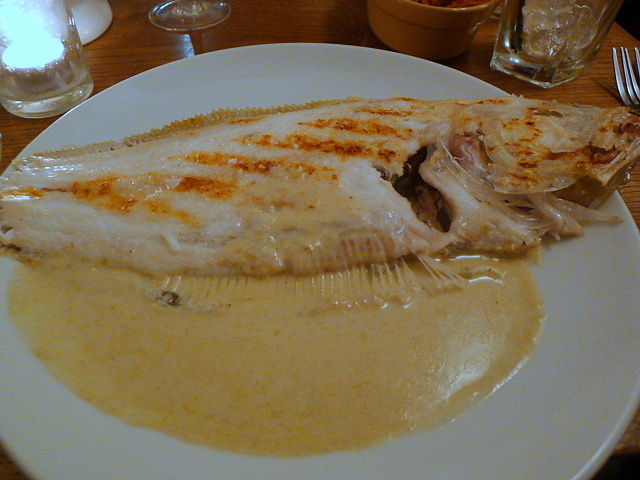 Whole megrim sole with bone sauce (£16) was perfectly cooked, very moist and generously sized. The bone sauce was beautifully reduced from a mixture of Pernod, Noilly Prat, cod cheeks and bones, fennel, fish stock and cream to a nice, thick consistency. 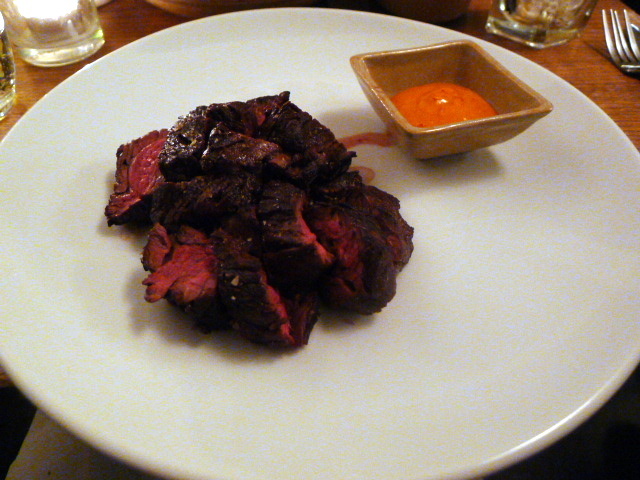 Onglet steak with kimchi hollandaise (£12.50) was nicely pink if a little chewy in parts. The kimchi hollandaise was great with a hint of tartness to it. 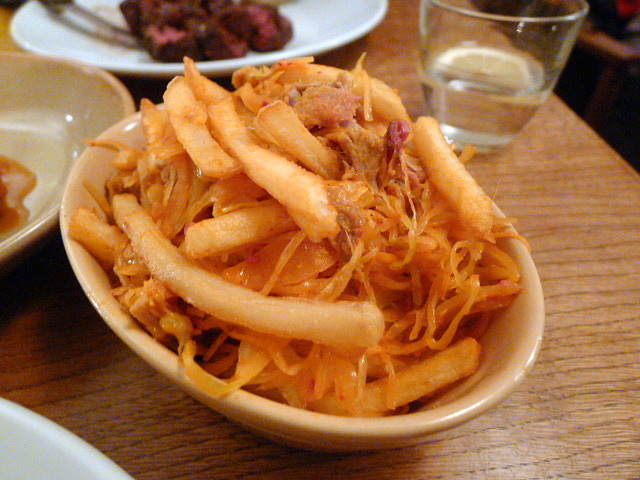 A side of frites with pulled pork, kimchi and cheese (£5) was every bit as fabulous as it sounded. An unusual but interesting combination, the flavoursome pork with the slight sharpness from the kimchi worked well with the scrummy fries. It scored ten out of ten for taste. So fattening, but sooooo good! 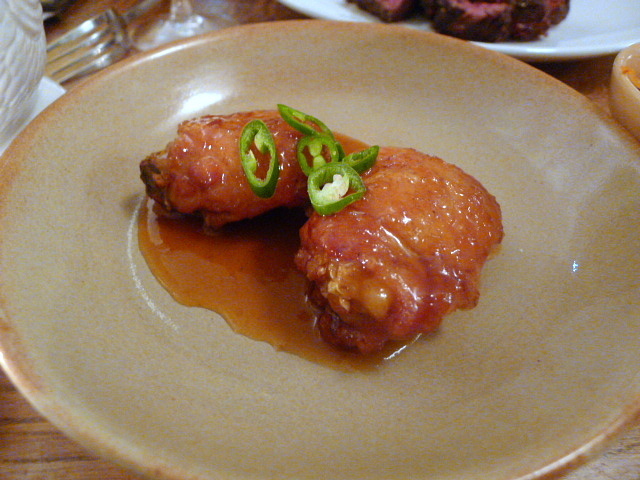 A second side dish of chili chicken thighs (£5) was tender and juicy. The chili sauce was lovely with its rich, thick, sweet finish. It wasn’t particularly spicy but it was very good. 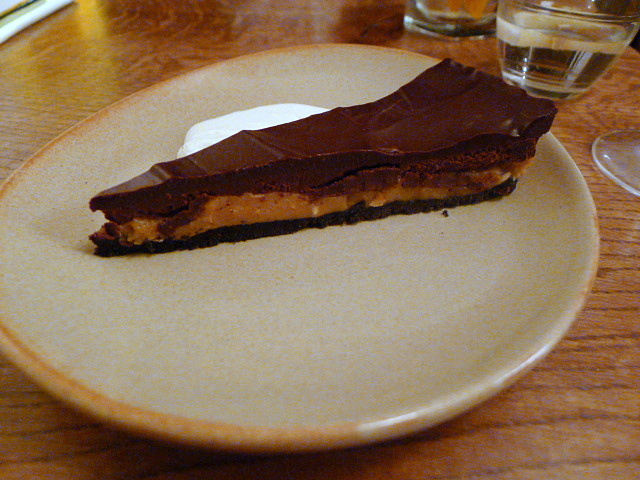 An oreo, peanut butter and chocolate tart (£6.50) tasted like a luscious snickers bar with a thick layer of rich chocolate on top. This was gooey and rich and a chocolate lover’s dream. An Earl Grey cream (£4.50) boasted of a nice Earl Grey flavour as well as a lovely creamy texture. Sprinklings of ‘burnt’ toast added a touch of crunchiness and a layer of marmalade provided sweetness. This was well made but it wasn’t to my taste. The food at John Salt was fabulous. The cooking was second to none, and the composition of the dishes bordered on nothing less than original. It was daring cooking with an eclectic twist, and a touch of elegant refinement to boot. Perhaps this was what surprised me the most about Chef Rankin’s food, that it was so poised and refined considering how gutsy and bold the menu sounded. It was unexpected but I loved it. We had nice service too as our Australian waitress was utterly charming. And what’s even better about John Salt is that it is really reasonably priced. Price range: £19 to £31 for three courses, excludes drinks and service.